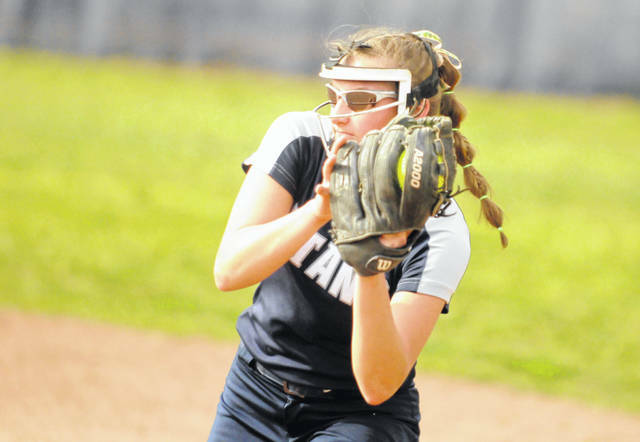 Notre Dame’s Isabel Cassidy squeezes an out in her glove during the sixth inning of Thursday’s 11-4 win over Clay. Clay’s Hannah Oliver throw a runner out during the third inning of Thursday’s 11-4 loss to Notre Dame. 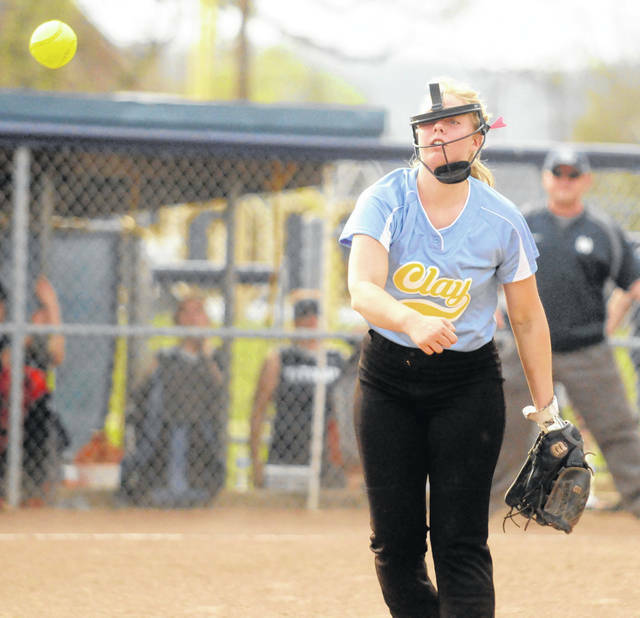 Notre Dame’s Cassie Schaefer struck out 10 hitters in the Titans’ 11-4 win over Clay, Thursday evening. PORTSMOUTH — For just a minute, it looked as if Clay was locked in Thursday evening. That is, until Notre Dame’s Cassie Schaefer forced her hand. In battle at the top of the SOC I standings, the Panthers came out and immediately took a 2-0 lead over Schaefer’s Titans — using a hit batter and two base hits, in succession, to do so. But in the bottom of the inning, Schaefer’s teammates gave her a one-run lead by scoring three runs of their own, and then kept tacking on frame by frame. That’s all Schaefer needed to silence Clay the rest of the evening … and all the Titans needed to earn a pivotal 11-4 win over the Panthers and stay undefeated. Schaefer, a second-team All-Ohio selection last season, struck out 10 on the evening while surrendering four earned runs on a total of seven hits. In her past four outings, Schaefer has whiffed 37 hitters. While Schaefer settled in after the first inning, her offense did her every favor it could. 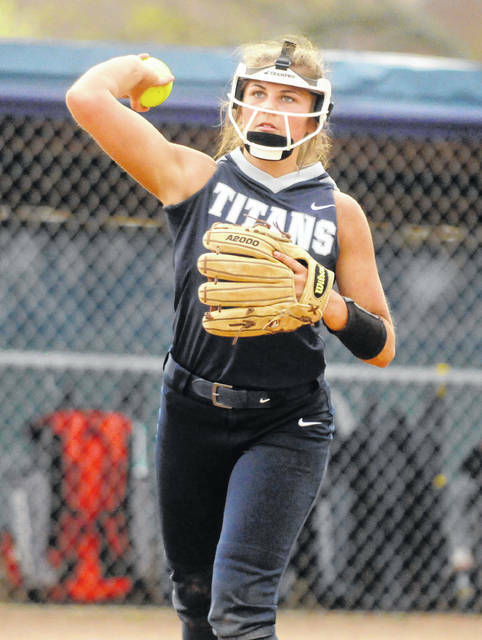 Hitting against Clay’s Hannah Oliver, a magnificent pitcher in her own right, the Titans (13-0, 9-0 SOC I) pounded out 11 hits and consistently put pressure on the Panthers’ defense. The stage was never too big for any of Notre Dame’s hitters. After Clay pushed two runs across the plate in the first — keyed by a two-run single via Jensen Warnock — Notre Dame answered by scoring on an error, an RBI single from Taylor Schmidt and an RBI groundout from Mady Suter, taking a 3-2 edge into the second. After Schaefer sat down the next three batters, Claire Dettwiller made it 5-2 with a hard-hit two-run double into the left-center field gap. Schaefer then helped herself with a two-run single, scoring Dettwiller and Isabel Cassidy, making it 7-2 and putting a cap on a four-run inning. In the fifth, Clay’s Megan Bazler cut the deficit to 7-3 with an RBI single. But the Titans answered again in the bottom half of the inning, scoring four more runs on hits from Suter, Chloe Hayslip and Ava Hassel, extending the lead to 11-3. The Panthers (10-2, 6-1 SOC I) scored their final run in the top of the seventh, producing the night’s final. Notre Dame’s offense was led by Cassidy, who finished 3-for-4 with two runs, while Schmidt was 2-for-4 with a run, a stolen base and an RBI. Hassel was 1-for-2 with two runs, two RBIs and a stolen base, and Dettwiller, Schaefer and Suter all had two RBIs each. For Clay, Shaelyn Vassar was 3-for-4 with a double, a run and an RBI, Bazler was 2-for-3 with a double, two runs and an RBI, and Warnock was 2-for-4 with two RBIs. Oliver took the loss in the circle, throwing six innings, striking out six and allowing just three earned runs — five Clay errors. The Titans get back to action Monday evening at New Boston while the Panthers try and put an end to their two-game skid the same evening at Eastern.